A cloud spam filter MX – the shorter name for a cloud-based spam filter for mail exchangers – is one of the simplest and most versatile methods for eliminating unwanted emails and protecting your network against email-borne threats. A cloud spam filter for Microsoft Exchange is easy to implement, updates in real time and can be managed from any Internet-connected device. Like most cloud-based applications, a cloud-based spam filter for mail exchangers has no capital expense, it is compatible with every operating system, and has no limit on the number of users. Organizations simply subscribe to a provider´s service, redirect their mail exchanger (MX) record, and configure the service for the monitoring features and report options they require. When you send an email, its passage of travel is from your email program to your outbound email server. Your outbound email server asks a DNS server where the email should go. The DNS server replies with an MX record, which is the address of the inbound email server for the recipient. Your outbound email server sends the email to the recipient´s inbound email server, from where he or she picks it up the next time they log into their email account. When you implement a cloud spam filter MX, it changes the address of the MX record from your inbound email server to the inbound email server of your filtering service provider. Your filtering service provider then inspects each email for spam and malware, before forwarding spam-free and malware-free emails onto your inbound email server – not only helping you to eliminate spam and enhance your online security, but reducing the load on your email server. The cloud-based filtering service uses a series of multilayered mechanisms to detect spam and email-borne threats. These typically include comparing inbound emails against blacklists of known spammers and their IP addresses, identifying attempts to disguise spam as genuine email, and Greylisting – where the cloud-based spam filter for mail exchangers asks for each email to be resent. Greylisting is a very important feature to have in a cloud spam filter MX. Spammers´ servers are too busy sending out spam emails to respond to the request for an email to be resent. Consequently, the request is denied and the email is classified as spam. 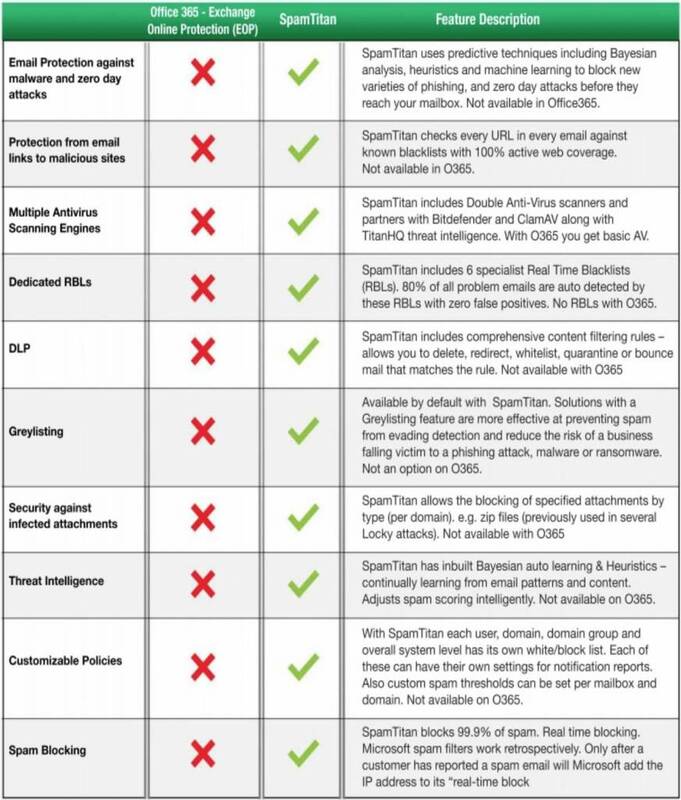 As Greylisting identifies new sources of spam before they appear on a global blacklist, a cloud spam filter MX with Greylisting catches more spam than comparable products lacking this feature (such as Microsoft Exchange Online Protection). A cloud-based spam filter for mail exchangers performs two other important functions in addition to eliminating spam emails. The first is providing antivirus protection. Although most organizations will have antivirus software installed to protect their networks from adware, spyware and botnets; a cloud spam filter MX adds additional levels of online security through phishing protection and malicious URL blocking – quarantining any email suspected of linking to a malicious website. The second additional function is outbound email scanning. This ensures that you organization does not send out emails containing malware – or links directing the recipient to a malicious website – or anything that could be perceived by another cloud spam filter MX as being spam. This function ensures that your organization´s IP address does not appear on a global blacklist, with the consequence that the delivery of your organization´s emails would be delayed. Since 1999, SpamTitan has been developing email and web security solutions for organizations and Managed Service Providers (MSPs) of all sizes. More than 5,000 customers currently use our solutions to eliminate unwanted emails and protect their networks against the risks of email-borne threats due to their ease-of-use, versatility and effectiveness. Our cloud-based spam filter for mail exchangers is SpamTitan Cloud – a powerful cloud spam filter MX with a verified 99.97% spam detection rate and a low false positive rate of just 0.03%. SpamTitan Cloud is infinitely scalable and therefore suitable for every organization from the smallest home-based office to the largest multi-national company. Antivirus scanning is performed by two of the top software providers in the industry – Bitdefender and ClamAV – ensuring 100% malware detection. Our cloud spam filter MX ensures email continuity in the event of downtime or a server outage, and customizable configuration settings, monitoring features, and report options can be managed via a web-based portal with an intuitive interface. If your organization is a Managed Service Provider for smaller companies or service reseller, SpamTitan Cloud protects your networks from rogue or hacked customers. It is available in white label format for rebranding and comes with an extensive API set for integration with third-party management tools. SpamTitan Cloud makes a cloud spam filter MX profitable – for you and for your customers. White Label Option for MSPs. Although most email services provide some level of proprietary spam detection, third-party spam filters for incoming mail increase the level of spam email detection considerably. 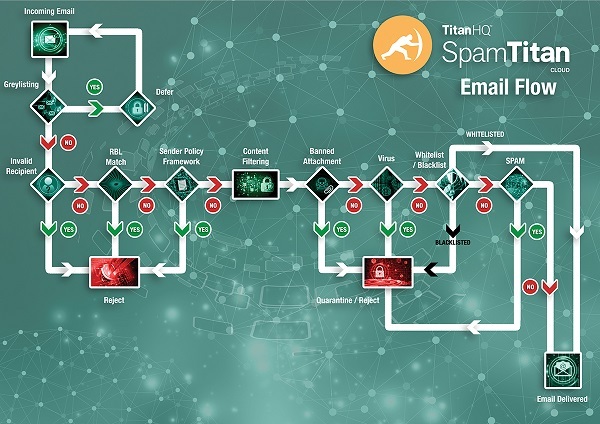 Organizations that fail to implement a third party mail spam filter like SpamTitan continue to have high levels of spam delivered to their employees´ inboxes. Undoubtedly, the most effective way to evaluate a cloud spam filter MX is to try it in your own environment to establish that it does what it says it does. In this respect, we invite you to try SpamTitan Cloud free for thirty days- with full technical and customer support, and with no obligation to subscribe to our service once the trial period has expired. To find out more about our offer – or more about how a cloud spam filter MX works – please do not hesitate to call our team of Sales Technicians. One of our team will be happy to answer any questions you may have about a cloud-based spam filter for mail exchangers and guide you through the process of redirecting your mail exchanger (MX) record in order to start filtering your emails within minutes.